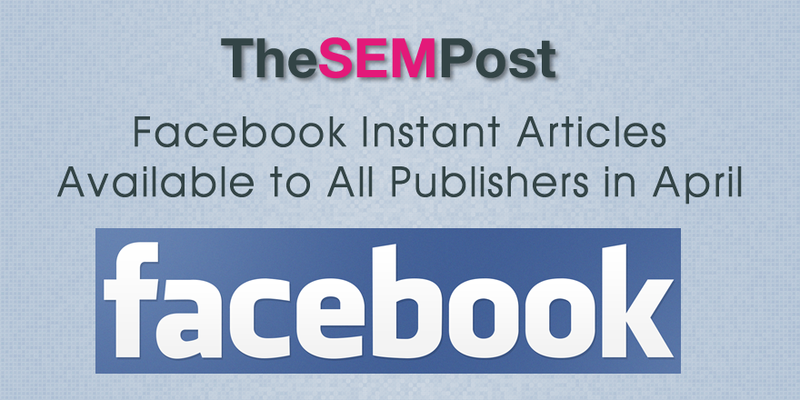 Facebook is opening up Instant Articles to all publishers, Facebook announced yesterday. However, it is a merely just a pre-announcement, as Facebook does not actually plan to make it available to publishers until April. Facebook’s Instant Articles allows Facebook to serve articles directly within Facebook, saving a user a click through to a website that might be slow to load. But with that, the publisher misses out on getting that visitor onto their site where they might view more articles, share it outside of Facebook or click on a regular ad. It is unclear exactly how popular Facebook’s Instant Articles are, although they announced in December they had over 350 publishers on board. However, some may have only been testing it out, and not using it for a significant portion of their articles. Facebook’s Instant Articles serve ads, under strict ad serving guidelines, or will also sell ads on those articles via their own ad network. For ads run through Facebook, rather than the publisher’s own ad networks, publishers would get 70% of the revenue. But the advertising issue is a huge deal to many publishers, who find the restrictive ad requirements result in a significant loss of revenue from articles served via Instant Articles rather than on their own site. The timing is also very interesting, especially as it is merely a pre-announcement that they will make it available. Google is expected to announce that they are making AMP articles live in the search results at the end of the month. AMP – Accelerated Mobile Pages – is their own variation of a lightweight article serving for users with slower internet connections. Facebook will open Instant Articles to all publishers on April 12th, coinciding with their F8 Conference. They ask interested publishers to review their guidelines in the meantime, in anticipation of the launch.